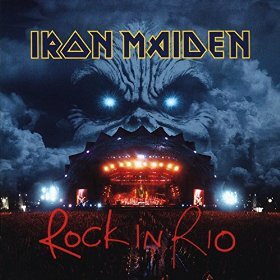 Rock In Rio is a live album by Iron Maiden. It was recorded at the Rock in Rio festival, Brazil in 2001 on the last night of the Brave New World Tour in front of about 250,000 people. What Is The Best iron Maiden Live Album? Is this the best Iron Maiden live album? Iron Maiden obviously fit into the heavy metal and hard rock category but what are the best albums? This entry was posted in 2000s Live Albums, Heavy Metal Live Albums and tagged 2000s hard rock, 2001 live albums, heavy metal 2001, Iron Maiden Live Albums by Paul Simister. Bookmark the permalink.